A very successful soldier, skilled diplomat, very talented musician, family man and my best friend for over sixty years. On a Sunday early in September 1955 this National Service man arrived to join his regiment at Catterick 5 Royal Inniskilling Dragoon Guards as a newly commissioned 2 LT. The following day I made my way to my new job as 21/C of the potential officer’s wing then under the command of Captain Ian Manning the terror of the P.O’s. I knew him well having spent plenty of time in the wing having had a hiccup at the war office selection board. That proved to be the best possible outcome for me because the Colonel, Monkey Blacker, invited me to join the regiment rather than the one originally planned. On arrival I find next to the very small office that I was to share with Ian, Sgt Macreadie and Lance Corporal Brooking who had a similar hiccup! Patrick and I became good friends and after a while we talked about future plans and I recall saying to Patrick “why don’t you come back to the skins rather than the regiment you had planned”? The RSM, Jim Boardman writes “I remember him so well from his initiation to a military life not because he appeared to be a potential officer and certainly not to become a high ranking one to hold unique jobs which included GOC in Berlin but because he was placed under my command to introduce him to black and white military expectations. He was too polite, kind, sympathetic. He had a depth of compassion and a respect for all. I recall telling him, as my orderly Corporal, to assemble six men who were to form part of the rear guard. He turned to the men, all recruits, and said “will you follow me chaps?” I shouted, “fall in outside and get a move on! !” It is all credit to him that he never changed and was to carry out tasks which no officer in my time ever did. At Christmas 1955 I produced a pantomime Cinderella? Guess who was Cinderella? Better things were to come, Friar Tuck in the staff college panto some years later but maybe Monkey Blacker was won over by his dramatic skills and he joined the regiment in 1956. Patrick’s step-father, General NAP White had been at Shape Allied H.Q. after the war and Patrick spent a year at the Sorbonne. His gift of languages stood him in good stead. Patrick’s father had worked in MI5 during the war and it was some time later that Patrick met him and his stepmother Mair. The first time that I met Pam was on a theatre trip to London when there were signs that this was serious. Indeed we both made a point of introducing potential wives to each other for inspection! They were married in 1964 and we in 1967. We were, with several other members of the regiment, both employed by Sir Michael Ansell the director of the Horse of the Year Show and Colonel of the Skins in 1961. A photograph of Patrick looking so smooth escorting Prince Philip, but no smart hotels for junior stewards and we shared a very small caravan with three berths, a double and a single. Patrick had to have the single bed because he snored and Peter Welch who was to become my brother-in-law and I shared the other. Chaos in the morning when Peter used to refer to the “the oil change”, lots of scented hair oil for Patrick who charmed the Assistant show director’s wife and persuaded her to muck out our van on a daily basis! We move on and another former RSM writes “how great you both were when Patrick was commanding. It made everyone feel part of a big close family and that you were both there to help when and wherever you could.” Incidentally he also mentions Cinderella. Laughter was never too far away. I have tried hard to find something even vaguely critical about Patrick. I describe this as a narrow sqeak! Responsible as a Staff Officer for a gaggle of Generals by General Sir John Sharpe flying to Paris the General asks “are we arriving at the civil or military airport?” This was a detail that had escaped our good friend so wildly guessing he said “military”. Looking anxiously out of the small window he spies a row of black Peugeot cars awaiting. Whew! Once on the ground he speaks to the lead driver in his best French. I did not know which airport we were coming to. “Neither did I” was the reply so we parked between the two airports and then drove at great speed here! Having talked about Patrick it would be very remiss not to refer again to Pam. She was a hugely important member of the team and was able to follow with their children, Jonathan, who will speak about his father and is also a member of the regiment, and Samantha. Music has always played an important part in Patrick’s life. His involvement with the Berlin Philharmonic Orchestra and the two choirs in part celebrated by the choir today all of who wanted to be here. One member writes about the Berlin visit ‘the huge experience of bringing a small choir to sing with the orchestra and the other choirs “the Requiem” just at the time in 1989 when the wall had collapsed was an unforgettable experience”. His friendship with Yehudi Menuhim proved Patrick’s wide musical ability. 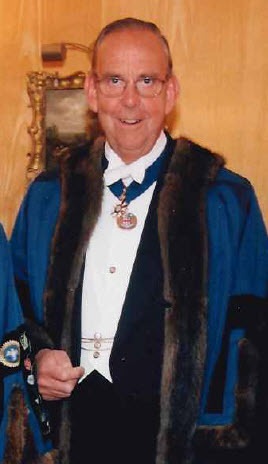 Patrick became Master of the Worshipful Company of Broderers Livery Company in 2003 another job that he much enjoyed. One of the traditions of the Company is that the Master has to sing a song, first sung in 1840, sitting down. Doubtless because the Master of the day, having taken wine with everybody was unable to stand up! The Master’s splendid chair has one arm with a hinge on it so that the Master of the day could be lifted out if all else failed. I cannot recall Patrick needing the help and he of course sang superbly. But telling all that they think. We shall all miss that hug of welcome but we should all be joyful about what the whole family has achieved. I quote Hillaire Belloc because he sums up so well.